Mevlüt Çavuşoğlu was born on 5 February 1968 in Alanya, Turkey. Mr. Çavuşoğlu received his Bachelor's Degree in International Relations from Ankara University in 1988 and completed his Master’s Degree in Economics at Long Island University in New York in 1991. He also completed the Expertise Programme on European Union in European Research Center at Ankara University in 1993. He started a PhD Degree in International Relations at Bilkent University as a special student in 1993 and carried out research at the London School of Economics (LSE) between 1993 and 1995 with the Jean Monnet Fellowship. 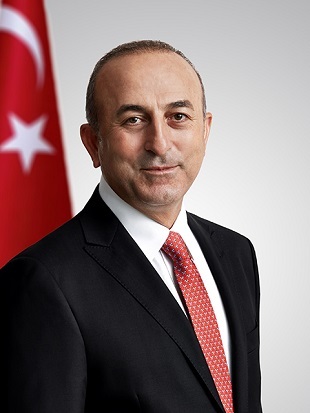 Mr. Çavuşoğlu is a founding member of the Justice and Development Party (AK Party). He was elected as Member of Parliament from Antalya for the 22nd, 23rd and 24th Parliamentary Terms. He was the Vice Chairman of the AK Party in charge of Foreign Affairs from January to December 2013. He was the Chairman of Turkey-USA and Turkey-Japan Inter-Parliamentary Friendship Caucuses. Between 2003-2014, at the Parliamentary Assembly of the Council of Europe (PACE), he served as Vice President, Chairman of Turkish Delegation, Chairman of the Committee on Migration, Refugees and Population, Chairman of the Sub-Committee on Migration, Chairman of the Sub-Committee on Tourism Development, Member of Monitoring Committee, Committee on Economic Affairs and Development, Committee on Legal Affairs and Human Rights, Committee on Political Affairs and Democracy. He was also the 2nd Vice Chairman and Chief Whip of European Democrat Group (EDG). He was elected as the President of the Parliamentary Assembly of the Council of Europe (PACE) during 2010-2012 and is the first Turkish parliamentarian to hold this office. He was granted the title of Honorary President of the PACE in 2014. He was the PACE representative at the Venice Commission from 27 January 2012 to 31 January 2014. Moreover, he served as the Chairman of the Turkish Delegation to the European Security and Defence Assembly (Assembly of Western European Union) between 2007 and 2010. Mevlüt Çavuşoğlu served as Minister for EU Affairs and Chief Negotiator of the Republic of Turkey between 26 December 2013 and 29 August 2014. He served as the Minister of Foreign Affairs of the 62th Government of the Republic of Turkey between 29 August 2014 and 30 August 2015. He was reappointed as the Minister of Foreign Affairs of the 64th and 65th Government of the Republic of Turkey. He speaks English, German and Japanese. He is married and has one child.